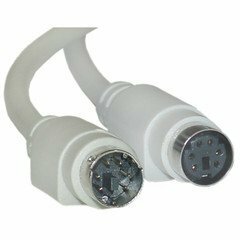 25 foot long PS2 6pin Mini Din Male to PS2 6pin Mini Din Female Extension Cable / Cord /Wire for Mouse or Keyboard use. We've used these cables up to 75ft with out any problems! Wired standard: straight through. If you have any questions about this product by Cable Wholesale, contact us by completing and submitting the form below. If you are looking for a specif part number, please include it with your message.